When I saw the call for articles for the issue of Communities focused on “Class, Race, and Privilege” (#178, Spring 2018), I was immediately struck by the lack of mention of disability. 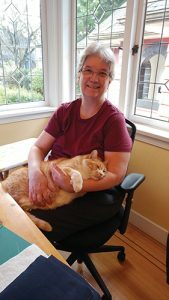 This absence mirrors both the absence of discussion of inclusion of disabled people in broader North American culture and the absence of the issue in literature by and about cohousing communities. Since 20 percent of North Americans have a disability, this absence is striking. It’s also very personal for me. I was a member of a forming cohousing community, Little Mountain Cohousing (LMC) in Vancouver, British Columbia between January and December of 2015. I regretfully left that community when I could not figure out how to have my disabling condition accommodated in the meeting-intense early stages of creating a new cohousing community. I’m a professor of education and anthropology on an extended medical leave because of an untreatable medical condition. A main symptom is chronic motion sickness; the condition has gotten progressively worse since its inception, and I now have severe problems with fatigue and nausea, especially later in the day. I’m also a highly social person with lifelong personal and academic interests in culture, adult learning, creating community, and creating alternatives to individualistic ways of being and working. I enjoy being with children, young adults, and adults my age. I have two grown children of my own. I want to belong to a cohousing community because cohousing attracts people with many of my values and perspectives. I was frequently moved by the consideration I saw playing out in other members’ discussion of a wide variety of issues, and I have a strong belief in cohousing and this community. After the call for articles came out, I invited LMC members to talk with me about our experiences around my departure. Some came to my home for conversation and others have read and commented on drafts of this article. I also asked for information about including people with disabilities on the listserv cohousing-l. Drawing on my experience in LMC, these conversations, and my reading of the cohousing literature, I have suggestions to make about including disabled people in forming and existing communities. I made contributions to the community that drew on my experience teaching adults and my interests in culture. For example, I designed an exercise to help us experience the shift from a “my home, my castle” mentality to a “thinking about the community” mentality. I joined and participated in cohousing-l, subscribed to this magazine, and enthusiastically bought and read books on cohousing, participatory democracy, and community-building. Despite all of this, I reluctantly withdrew from the community at the end of 2015 because I was exhausted by the demands the cohousing model and process placed on me. As I was leaving, LMC was still debating construction materials and priorities and searching for land. Both issues were critically important to me and I worried about what and where my future home might be. Other members of the community were gracious about forgiving me for my absence when I was unable to attend meetings, but this gracious attitude, however welcome, was no substitute for actual participation. I was also in my own personal state of transition and learning. Over the course of 2015, I continued to explore diagnostic and treatment possibilities for my condition. By the end of that year, I was forced to accept that there were no more medical options to pursue and faced the challenge of accepting a progressively restricted life. I couldn’t figure out how to continue and I was trying to solve this problem on my own. I failed to find a way to raise my sense of exhaustion with other LMC members. I do believe that most members of LMC would have been receptive to a conversation about accommodating me if we had been able to find a way, in those early days, to have that conversation. But the challenges to my participation were significant. The skills of facilitating and participating in consensus-based meetings were new to us all. Early meetings often ran over time. This left me hanging on through meetings that ran over so I could participate in final decisions. Our lack of a meeting space of our own meant I drove further than is good for me and sat in chairs that didn’t meet my balance needs. The needs of the working adults in the community meant that many meetings and social events were scheduled for evenings, and weekend meetings were scheduled in the afternoons as often as in the mornings. I was able, after some months of negotiating, to have our community meetings rescheduled to weekend mornings, and the community-building committee met in my home on weekend mornings. But overall, what I knew was that I couldn’t keep up; what I didn’t know was how to request and accomplish accommodations to include me. Since I left LMC, the community has bought land and has a building plan that looks likely to result in a lovely community in a neighbourhood where I would like to live. I’ve stayed in touch with community members and with our facilitator and have some sense of the community. In retrospect, I can see how things got to a place where leaving seemed like my only option, but I also feel that if I had stayed, I would be very happy to be part of this community and I would have had contributions to make. I believe it’s possible for many disabled people to more fully participate in community formation and community life. Some of the factors that combined to make leaving seem like the only option were my own. I was exhausted and ill. My personal process of accepting a long-term debilitating condition created an unfortunate confluence of my own trajectory and the trajectory of the community. Other barriers are aspects of my personal style. I tend to be better at advocating for other people than for myself, for instance. I prefer to raise problems when I can see possible solutions, and I couldn’t devise a solution by myself. I’m also a private person and didn’t feel comfortable discussing my medical issues with a group of strangers. It’s also easy to find discussions of how cohousers have been able to support one another with needs such as post-surgery recovery or reciprocal well-being checks. Still, the overall tone of cohousing emphasizes a hearty DIY spirit. Many communities celebrate how they managed much of the building process themselves, or how they manage their own grounds maintenance. These overtones can be discouraging to people with physical limitations. Cohousing communities have encountered individuals who are eager to ask for help in daily living. Those who are reluctant to ask for excessive help from others may be invisible as we self-select out of a culture that celebrates healthfulness and sturdy independence within community. We may have much to contribute and no intention of asking for excessive daily assistance and be unwilling to discuss our health difficulties in the face of this message. The cohousing spirit emphasises learning to consider the good of the community over the wishes of the individual. Explanations of how to participate in consensus decision making, for example, can undermine the need to ask for individual accommodation. We heard frequently that blocking a consensus decision should not be done because of a personal preference or need but because the community’s values or integrity would be damaged. I value the norm of considering the good of the community, but I was perhaps too cautious in expressing my needs. There are structures of cohousing that can be difficult for many disabled people. Since almost all disabled people find that some aspect of daily life is more time-consuming or fatiguing for them than for others, the time-consuming aspects of cohousing can be a particular barrier. For me, for example, sticking it out in meetings that ran over their scheduled time was not a simple irritant; I was pushed to choose between participating in an important decision and leaving before I was harmfully fatigued. LMC favoured face-to-face communication over written, especially electronic, communication. When it’s difficult to attend meetings or social events where issues are discussed formally and informally, closing the door on electronic discussions can close the door on a vital path to participation. How can communities better include disabled people? Clearly, not every disability can be accommodated in cohousing. Some things may simply be too severe or too complex to be addressed within a larger community. But many of us with disabilities are being unnecessarily and unintentionally excluded when we could be included with some simple changes. Creating an accommodation process, using electronic communication well, and building community capacity for difficult conversations can increase participation for disabled people. The most important suggestion I have is for communities to create an explicit accommodation process as they are creating their other processes. Accommodation may not be an issue that needs the formation of an ongoing committee, but spelling out how unanticipated needs can be addressed will benefit those of us with disabilities that interfere with our participation and others with situations that make participation more difficult than others realize. An accommodation process might be grounded in a community’s community-building committee. A process could consist of an open invitation to members to approach any member of the community-building committee with a need. The committee, or committee member, could work with the individual to create a small group that could discuss the difficulty and to explore possible responses and present them to the larger group for discussion and approval. Such a process could provide a relatively private venue for discussing medical conditions and needs. It could also be used to discuss other personal difficulties or concerns. This kind of established process could serve both individuals who need accommodation and the community at large. The small group could say “no” as well as “yes”; the structure can facilitate both assistance and boundary setting. In all circumstances, the community should focus on what they can and cannot do and refrain from offering unsolicited medical or lifestyle advice. Creating a process like this will require community conversation. This will itself be useful, raising awareness of the certainty that members of the community will ultimately need accommodation. A pre-emptive conversation creates an opportunity for discussion about principles and values rather than about an individual, and opens the possibility of greater ease discussing life’s difficult challenges. Communities can also work to use electronic communication well. It’s true that email and other forms of disembodied communication can lead to miscommunication and regrettable outbursts. But eliminating these avenues of communication also restricts members’ ability to participate in conversations. It would be better to put energy into learning how to communicate clearly and respectfully over email and group chats than to restrict this important avenue. Another form of electronic communication that could be important is software or hardware that facilitates easy distance participation in meetings. Whenever possible, the community should pay for the costs of distance inclusion instead of asking a disabled member to assume this personally, just as the community maintains a website and pays for meeting space and the like. In my discussions with LMC members, we reflected on how difficult it is to get to know each other in the early stages of community formation. We felt that, in retrospect, we could see that it would have been useful to engage earlier in activities to help us get to know each other. Slogging together through decisions about land and buildings can build trust and inter-group knowledge. But if we had also focused earlier on structured conversations about values, we might have come to know each other better. This could well have made it easier for me to ask for help. For example, last year LMC hosted a “vision and values” workshop that engaged members in conversations about what they wanted. This is the kind of conversation that would let us get to know each other and come to trust that difficult conversations are possible and safe. Forming communities should strive to give time to conversations about hopes, wishes, values, and fears as often as conversations about land and buildings. These experiences create the space for people to learn that they can indeed “trust the group.” Our facilitator frequently urged us to trust that the group decision-making process would yield solid decisions. For example, I can see now that some of the conversations about building priorities and locations that initially alarmed me resulted in decisions that please me. Within my first year of belonging to a forming community, I wasn’t in a place to know that “trusting the group” would yield positive outcomes—but I am now able to see how a cohousing community can come to sensible decisions through considering the diverse viewpoints and hopes of the group. More than one LMC member has told me they had wanted to encourage me not to leave when I declared my inability to continue. It might have made a difference to me if accommodation had been anticipated ahead of time. Cohousing aspires to be as inclusive as possible, but North American culture suppresses conversation about disability and health, which have long been considered private. How can we create processes where previously invisible needs can be seen and addressed—within limits—and have voicing those different needs not be an extraordinary moment or request but part of the process of coming together? Acknowledgements: I’d like to thank LMC members Jack Brondwin, Paul Cottle, Daisie Huang, and Ildi Varga, facilitator Kathy McGrenera, and colleague Shauna Butterwick for taking the time to discuss these ideas with me. Allison Tom is an Associate Professor in the Department of Educational Studies at the University of British Columbia on long-term medical/disability leave. A mother of two grown children, she was a member of Little Mountain Cohousing in Vancouver, British Columbia in 2015 and is working to build a new community in the Vancouver area. Search results: “disability inclusion” —No products were found matching your selection. Perhaps I didn’t search correctly. Or perhaps People with Disabilities (PWDs) have been overlooked, as is all too typical. Thanks for your reply. I much appreciate your sensitivity to this issue and your promise to do more in the future. Enlightenment is a process. As both a PWD and parent of two sons with significant disabilities, I have gained insight into the issue. A big part of my motivation for building intentional community stems from this experiential knowledge. Racism and sexism are addressed much more frequently than ableism. We know that diverse communities are the most creative and resilient, so making our communities as diverse as possible is not only morally correct, but institutionally profitable. Syracuse University has created an introductory guide to disability language and empowerment, including a section on “people-first” language—“a way of describing disability that involves putting the word ‘person’ or ‘people’ before the word ‘disability’ or the name of a disability, rather than placing the disability first and using it as an adjective.” That guide is here: sudcc.syr.edu/LanguageGuide. Some people describe my youngest son as “a Down’s kid” but I much prefer a “young man with Down syndrome.” My son is not his diagnosis. He’s blue-eyed, kind, methodical, organized, handsome, has a great sense of humor, gets along well with others, and is a big Harry Potter fan. And he also has Down syndrome. Please feel free to keep in touch and let me know how your organization is progressing on this issue. I think it’s wonderful that you are including “inclusion” in your discussions about community; the benefits to all are immeasurable! You touched on a painful point. You mainly talked about disabilities, but as we get older (I am 67) even if we are not medically defined as disabled there are more and more limitations that get in the way of participating as we would like to in community life. If like me, we are looking to join a community in that late stage this is even harder. I know that there are senior cohousing but I wish to be part of a multigenerational community. I believe we all can contribute, each in his own way, and especially across generations. I haven’t encountered a community, that isn’t a senior cohousing, that encourages older people to join. I understand you are in the process of building such a community, how can I get in touch with you?